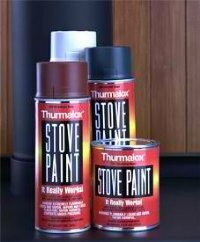 Thurmalox Stove Paint withstands continuous temp's to 1200°F. PLEASE NOTE: AEROSOL CANS MUST BE SHIPPED GROUND DUE TO BEING A HAZMAT. WE SHIP TO 48 STATES ONLY, NO INTERNATIONAL SALES. Might ship from factory with 2 week lead time possible, but unlikely. Must ship from factory to us with 2 week lead time likely. Will ship from factory to us with 2 week lead time to you likely. Will ship to us from factory; 2 week lead time is likely. Will ship from factory to us with 2 week lead time likely.